I have mentioned it a few times on my blog (I even have a link to bookmark with del.icio.us at the bottom of every post). My current poll asks: How do you manage your bookmarks? - 32% say del.icio.us so far. Find out what's popular - use the del.icio.us/popular page to see what web pages are being bookmarked most frequently today, there is also an RSS feed. If you monitor this page you will know about cool web sites and things days or weeks before the main stream. 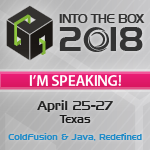 Keep up to date on a subject/tag - want to see the latest links about ColdFusion? visit: del.icio.us/tag/coldfusion. This page can also be monitored by an RSS feed. Find bookmarks by filetype - this was just added on Sunday - you can do http://del.icio.us/tag/system:filetype:mp3+jazz the RSS feeds for video and audio types use RSS enclosures so you can use them with podcasting software. Find by media type - the supported media types are audio, video, image and document. So you want to find the latest funny video's, checkout: http://del.icio.us/tag/system:media:video+funny. Very cool tips! Thanks for sharing. Have you checked out www.blinklist.com? It is another social bookmarking engine. Still small so less useful to discover new links for now but I love it to bookmark my own pages. Very slick new UI with favorites, popular, and latest links. Nice tips. I'm a del.icio.us user too, but recently discovered blinklist.com and I'm wondering if it is better. Thanks. I didn't know you could add tags after http://del.icio.us/popular - great tip for keeping track of the zeitgeist. Another tip - I use del.icio.us as a to-do list of pages to investigate or features to add to my projects (by tagging pages 'todo', 'toread', 'toinstall'). I just remove the tag when the job is complete. ???? ? ????? ?, ?? ????????? ???????? ? ???????? ??????? ?? ??????????? ???????? ????????. ?????????????? ?????????? ? ??????? ? ????? ?, "??????? ??????" , ????????????? ???? ? ??????? ??????? ?.